Added in Patch 1.13, the Token of Absolution is a consumable item that grants the character one stat/skill reset. This works in the same way as the reward from the Den of Evil quest, but allows a character infinite respecs, provided that they are willing to gather the reagents each time they desire a respec. 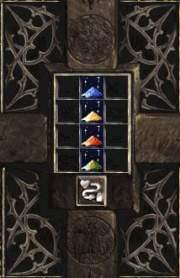 The Token of Absolution is created in the Horadric Cube by cubing together four different Essences that drop infrequently from the act bosses in Hell difficulty. Burning Essence of Terror (dropped by Diablo) - Festering Essence of Destruction (dropped by Baal).